Ultimate Fighting Championship has only become more and more popular over the years, which is why there are now more UFC bet types than ever before. Ultimate Fighting Championship betting is exciting and hot-headed and allows punters to place serious money on a number of exciting markets and opportunities for big money returns. As with other sports, MMA and UFC require you to know a fair bit about player history and form if you are to take advantage of the best markets and odds around – but it will only take you a little time to really get used to these standards. 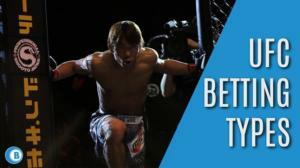 Match bet UFC opportunities are rife – who do you think will win a given match? Who’s been showing the best performance in the ring, regardless of pre-fight bravado? Take a look at the tale of the tape and place your punts on outright match odds. Many UFC bet types focus on who is likely to win – meaning that these can largely be seen as the default option for punters – but you can, of course, refine things even further if you wish through a number of different markets. Moneyline bet opportunities fall under this category, too. UFC accumulator bet options may be seen as lucrative to some punters, but risky to others. There’s plenty of reasons why many people punt for fight after fight on an accumulator. While it’s recommended that first-time punters take a look at outright bets, it’s worth working your way up! Open parlays are perhaps a little more relaxed than your standard accumulators. Parlay bet markets are similar to accumulator betting – only in an open sense, you will be able to defer the extra slots in your accumulator to a later date if you are not keen to waste your picks as soon as possible. These bet types are interesting to seasoned punters, though it’s worth noting that you’ll still need to be very careful about the money you punt forward. Remember, there are a number of betting sites out there so have a look to see which offer the best odds. Parlay and accumulator betting are great ways to win big, but you’re going to need to have knowledge and/or confidence to back you up along the way. Not interested in picking outright winners for such matches? Try a UFC under/over bet instead. A bookmaker like Paddy Power will give you a score to predict upon – simply choose whether or not you think the final total score will come out as more or less than their UFC bet tip. These bet types are nice little additions to simple outright betting and straightforward markets, which means you may wish to put these punts forward as little extras to help make your betting slip that little bit more interesting. Consider this a 50/50 chance – you can opt to widen the market and, of course, alter the amount you punt, too. There’s always ways you can help make things that little bit more interesting! Round betting is where things start to get a little bit more interesting. Instead of betting outright on who you think will win a given match, you place bets on how you think each round will go, from scoring to who will win each turn. Therefore, you can start to make picks that pull in regular money alongside your standard, outright bets. Effective betting is all about diversifying – with so many UFC bet types out there, it makes sense to take advantage of as many as you physically can, surely? UFC handicap betting works similarly to handicap bets elsewhere in the sport world. Bookmakers will simply add handicaps or extended ‘win’ conditions to certain bets and odds so that the underdog for any given match doesn’t carry the most extensive odds. In practice, this could mean that if you bet on the favourite for any match to win outright, they may need to win by a certain number of points, or to score highly across several rounds for your bets to come in. It’s a nice way to mix things up a little. Live UFC betting takes things to a whole new level. Why punt outright on matches ahead of time when you can take advantage of evolving odds and markets as matches are underway? Any true fan will know that matches can have a habit of changing drastically mid-play – which is all the more reason to start looking at punting during the in-ring dramatics. Ultimate Fighting Championship betting is seriously intense at times – why not kick things up a further gear? 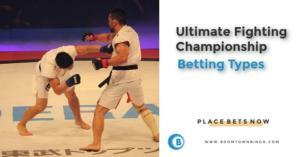 You can place bets on various UFC events and championships, so make sure to have a look at the various betting types. 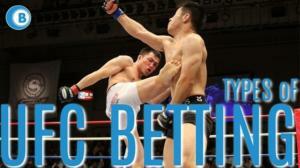 Interested in betting on decision victories UFC? Sometimes, wins aren’t as cut and dried as they may seem – which means things can come down to a deciding vote on who fought the best. Decision victory markets are particularly precise, meaning that you will likely need to be heavily invested in the sport or confident in your betting prowess to really punt on these markets regularly. UFC prop bets take things right down to the wire! Why bet on outright markets when you can choose precision markets in any given match? Choose who will land the first blow, who will go down first, even when it will all happen – if you know your stuff when it comes to UFC and its fighters, prop or proposition bets are the way forward each and every time. Liven up your bets by going for precise prop opportunities!